After nearly 24 years at the helm of Missouri Baptist University, President R. Alton Lacey will retire at the end of the 2017-2018 academic year. Dr. Lacey announced his retirement, effective June 30, 2018, at the quarterly MBU Board of Trustees meeting May 25. Dr. Lacey is now the longest tenured president in the life of MBU and, for that matter, of any sitting college president in St. Louis. In 1995, he was appointed as president of then-Missouri Baptist College after serving for 18 years as a faculty member and administrator at Louisiana College. His tenure at MBU has proven to transform what was a small, fledgling college into a flourishing Christ-centered University. Under Dr. Lacey’s leadership, the University has grown exponentially. This past year, MBU saw record-breaking enrollment with more than 5,700 students studying at the undergraduate, graduate and doctoral levels. The number of resident students has also increased since Dr. Lacey took office—from around 100 students in 1995 to more than 400 today. 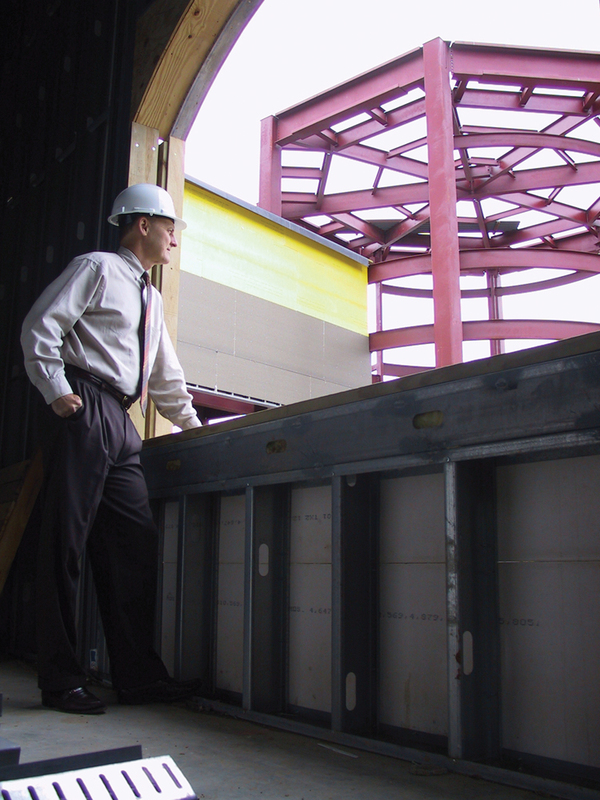 Dr. Lacey looks outside a window from his office located in the Pillsbury Chapel and Dale Williams Fine Arts Center as it was under construction in 1999. Such enrollment growth can, in part, be attributed to the vast number of academic programs that have begun under Dr. Lacey’s leadership. In 2000, the University launched its first masters-level program, a decision that would pave the way for the 12 graduate programs and the doctorate in education that are in existence today. The University has also launched many undergraduate programs offered at the University’s main campus, 12 regional learning centers and online. Just this week, MBU received initial approval to offer a four-year Bachelor of Science in Nursing program. The University’s athletic program has also seen dramatic growth. Today, MBU has 27 athletics teams that are competing nationally through the National Association of Intercollegiate Athletics (NAIA). Of particular significance was the birth of MBU’s football program in 2014. Along with such growth, the University’s main campus has undergone an indisputable renaissance. In 2000, the University completed construction of its hallmark facility, The Pillsbury Chapel and Dale Williams Fine Arts Center, which continues to serve as the University’s flagship building. Also under Dr. Lacey’s leadership, MBU has constructed North Hall, The Perk coffeehouse; Spartan Village, which includes apartments and the innovative Spartan Row; a new bookstore; the Carl and Deloris Petty Sports and Recreation Complex; and the Spartan Field and Fieldhouse. Dr. Lacey will spend his final year at MBU, in part, working closely with the Board to ensure a seamless transition as the University begins the search process, which will be announced at a later date, for its next president. “Thank you and God bless each one of you as we head into this final year of my service and soon into a new era for the University,” said Lacey as he concluded his remarks.